The MIT Sloan Executive MBA program is a 20-month, “mid-career” program for executives and managers who have significant professional experience. Classes meet on Friday and Saturday every third weekend, with a week-long module course every six months; there are a total of 26 weekend sessions and five 6-9 day long module courses. In addition, students complete a week-long international trip called the Global Organizations Lab near the conclusion of the program. Each weekend session, students must take between two and four required courses. However, each January and during the spring of the program’s second year, students have the opportunity to take one or two elective courses. MIT Sloan Executive MBA students can also take elective courses cross-registered with Harvard and MIT’s full-time MBA programs. The four week-long module courses each have a theme. In order of module, these are: Leadership and Integrative Management, Innovation Driven Entrepreneurial Advantage, Leading in a Global Context, and Leading With Impact. The program also features the Organizations Lab, in which students apply the lessons they have learned in the first half of the program to their current organization, and the Global Organizations Lab, in which students travel abroad in teams for a week to work with an international company. The MIT Sloan Executive MBA Class of 2020 is made up of 126 executives who have an average of 17 years of work experience and come from a range of industries and backgrounds. Nearly 83 percent of students in the class have already risen to at least the level of Director within their organizations. About 60 percent had earned advanced degrees prior to matriculating at Sloan and 48 percent are international. The total tuition for the MIT Sloan Executive MBA Class of 2020 is $169,000. This figure includes course materials and the basic travel costs associated with the Global Organizations Lab international experience. 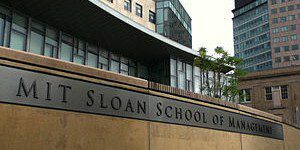 Additionally, Sloan estimates that EMBA students will spend approximately $20,000 on lodging and incur a variety of additional expenses, including travel to and from the program, computer costs and health insurance costs if the student is not already insured. MIT Sloan EMBA students who are U.S. Citizens or Permanent Residents are eligible for Graduate and Professional Student Loans and Private Education Loans, although they are not eligible for Federal Direct Stafford Subsidized Loans and Federal Perkins Loans. International Students are not eligible for government loans but may qualify for private loan programs. Sloan estimates that 60 percent of students received some degree of loan financing or financial aid. Each year, the EMBA program awards a number of Sloan Leadership Fellowships to outstanding applicants who contribute to the diversity of the incoming class. Admitted students are automatically considered for these awards. While MIT Sloan doesn’t always require that applicants possess an undergraduate degree (exceptions will be made for those without degrees who possess exceptional achievements), a stipulated amount of work experience or GMAT scores, the program does note that promising applicants will possess a degree, at least ten years of work experience and GMAT scores if they feel their transcript scores do not accurately represent their profile. All applicants must be working full time at the time of their application to the program. After registering their interest, applicants to the MIT Sloan Executive MBA program must submit a 500-words-or-less statement of purpose outlining their qualifications and reasons for pursuing an EMBA, and the contribution they intend to make to their class. Additionally, applicants must submit a resume, three essays, two letters of recommendation, organizational chart and official transcripts from any undergraduate or graduate institutions attended. Applicants whose native language is not English may have to submit TOEFL scores. This decision is made at the discretion of the EMBA admissions committee after students have “registered their interest” in the program via the EMBA website. • Statement of Purpose: Taking the above into consideration, please tell us why you are pursuing the MIT Executive MBA now. What has influenced your decision to apply, and what will you contribute to your classmates and the MIT community? Include examples of success working with organizations, groups, and individuals. • Essay 1: The educational mission of the MIT Sloan School of Management is to “develop principled, innovative leaders who improve the world.” Please discuss how you will contribute toward advancing this mission based on examples of past work and activities. (500 words or less, limited to one page). • Essay 2: Please tell us about a time when you introduced an idea that changed the way in which your organization approached a business challenge or opportunity. Comment on the factors considered, and the barriers or obstacles faced.